The numbers are stunning. In San Francisco, felony juvenile arrests were over 160 per 10,000 youth in the mid-1990s. Today, that ratio is well under 20 per 10,000—less than one-eighth as much. While San Francisco’s decline is extreme, statewide the number of juvenile offenders fell from over 60 per 10,000 in 1990 to less than 20 per 10,000 today. 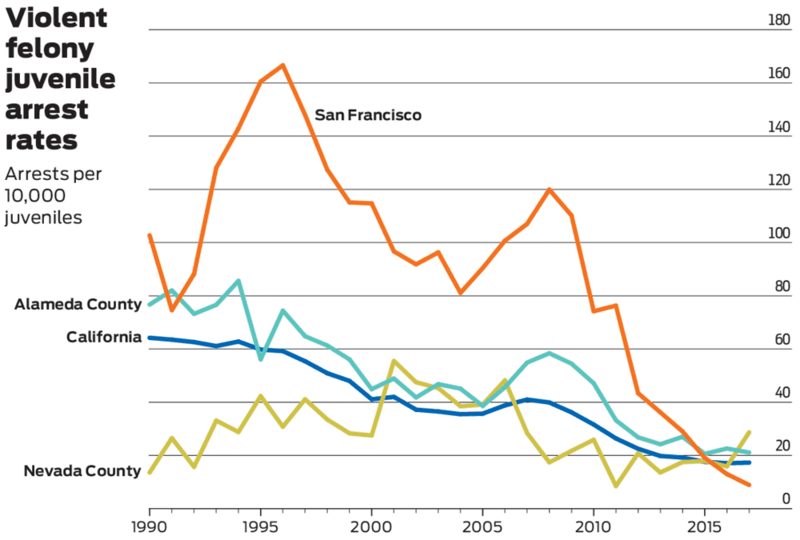 A chart in the San Francisco Chronicle vividly displays the dramatic change. As Jill Tucker and Joaquin Palomino of the Chronicle explain, “In California, homicides of juveniles dropped 83 percent—from 382 in 1995 to 63 in 2017, the latest state data show. 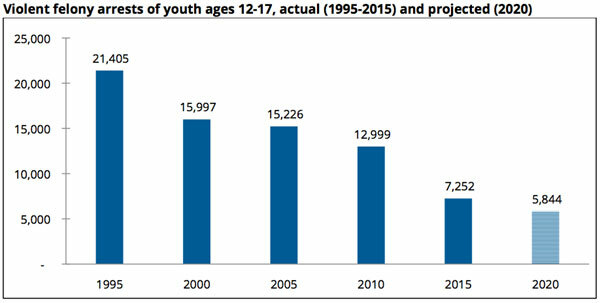 Youth arrests for violent felonies in the state dropped 68 percent—from 22,601 in 1994 to 7,291 in 2017.” But while crime has fallen, spending on crime has not. The result: “Some California counties are spending $1,400 a day to incarcerate each juvenile, or $500,000 annually, up from $400 a day or $150,000 annually just eight years ago.” Not surprisingly, given recent teacher strikes in Los Angeles and Oakland, Tucker and Palomino make the direct link to education, pointing out that, “By comparison, the state spends roughly $11,500 a year to educate each K-12 student.” California current enrolls 6.2 million children in its public schools. If the $15 billion going to juvenile justice could be cut in half to reflect the reduced arrest levels, that would free up an additional $1,200 in per-pupil funding, more than a 10-percent increase. “The falling crime rate, particularly among youths,” note Tucker and Palladino, “raises larger questions about societal priorities and long-term impacts.” In Oakland, for instance, 18 youth were slain in 2006, but only one in 2017. “We could get to a point where we achieve our mission of ending violence in Oakland,” says Anne Marks, executive director of Youth Alive. “You could picture how it could happen.” Because fewer teens and young adults are getting into trouble, the group has expanded its violence prevention efforts to include those under 35. Criminologist Jay Albanese, a professor at Virginia Commonwealth University, sees the potential, noting that instead of spending billions on criminal justice, money could go to housing, health care, employment training, and education. In California, “Since the 1990s, youth held in state-run youth prisons has plummeted, from 10,000 to about 650,” Tucker and Palladino explain. A so-called “realignment law” has redirected most young people who need to be detained into county-run juvenile halls.